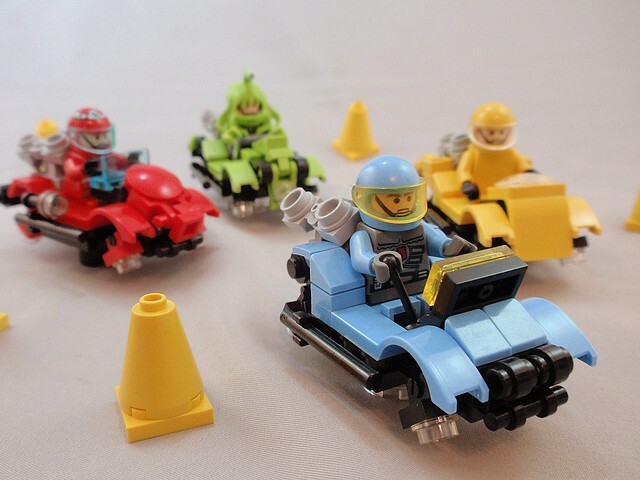 FuturGo Carts | Flickr - Photo Sharing! Funded by the hazardous material waste cleanup super-company, the Oozie Clean cart take a narrow fourth! At a challenged third, the Cherry Bomb, sponsored by Red Inc. races onward! The continental car of the Asian continent is just barely kept out of first place! In the lead, sponsored by the Sky, the blue car could be this year's champion! The next big thing on ESPN5270! The IGCRL (Intergalactic Go Cart Racing League) kicks off its biggest race of the year (again!) with the GreySpace Rumble Rally! Who will emerge victorious this year? And who will go home dead? I know I said that I had no LEGO at college. Hell, I don't even have my lightbox. I went home to see my brother just before classes started (we don't go to the same college, unfortunately*). I've had these built for a while, bt only recently got around to photographing them. And then just now got around to actually posting them. *There is a story full of sighs and denials to be told here, but you don't really care, do you? Aaand here's the Gallery that I did not forget. The One And Only Mr.R, Martian Cthulhu, and 34 other people added this photo to their favorites. lol, who will go home dead. "The IGCRL kicks off its biggest race of the year (again!)" Heck, Asia should win. But awesome concept, I'd like to see more of these in the future. Lovely idea, I'm diggin' it.